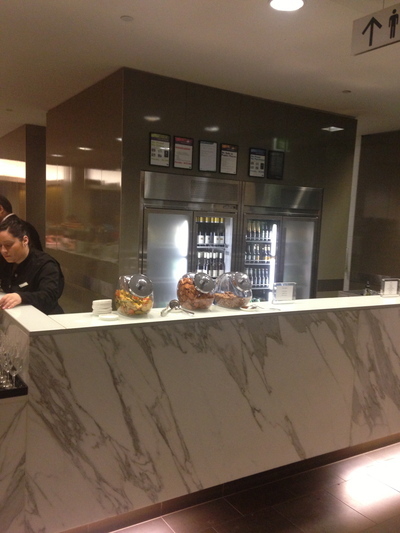 The Qantas Club lounge at Melbourne's Tullamarine Airport is split into two sections. 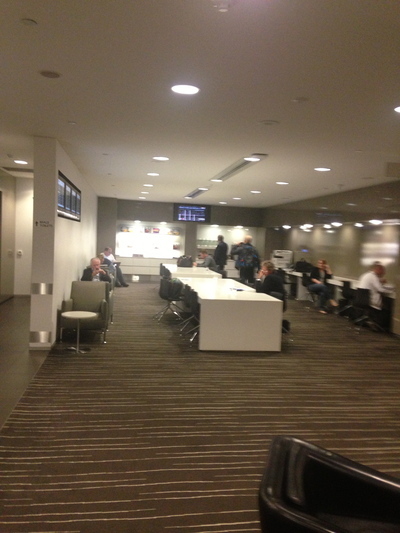 There is the regular Qantas Club lounge for those with invitations, Qantas Club Members, and Gold and Platinum Frequent Flyer Members.Then there is the Melbourne Domestic Business Lounge for Business Class and Platinum Frequent Flyer members. You enter via the Qantas Club lounge, but head further down to a private sanctuary. It's a nice escape from the sometimes noisy regular Qantas Club. The welcome is warm and polite. It's what you'd come to expect at this level. 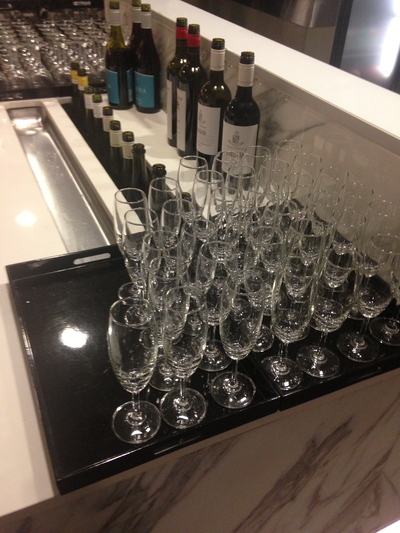 It's completely natural to want to head to the bar where quality wine and champagne awaits. If anything else takes your fancy, just ask at the bar. 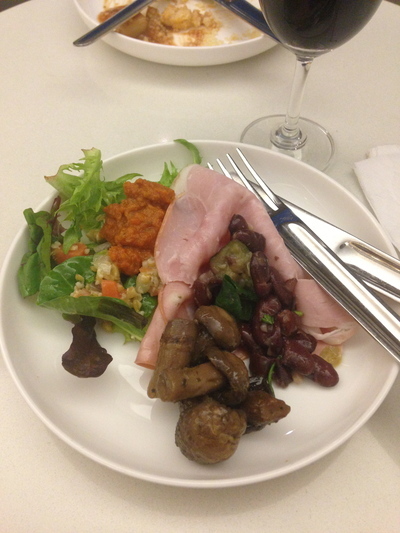 It is easy to become quite hungry once you head to the lounge, especially when you have a relatively long-haul domestic flight ahead of you; even if your seat is at the pointy end of the plane. For starters, the beef stew with cous cous sets the scene for a perfect (and healthy) antipasto and salad offering. The salad is rather appetising, in tandem with some bright, fresh ham. Afterwards, you can try some chocolate brownies that can be found at a communal dining table opposite the self service food area. Some of the lounges need to be replaced due to a few stains on them, otherwise the seating is all quite comfortable here. If you're lucky, you might also find yourself perched on a creme coloured leather chair, with a matching footrest to put your feet up and feel at home. 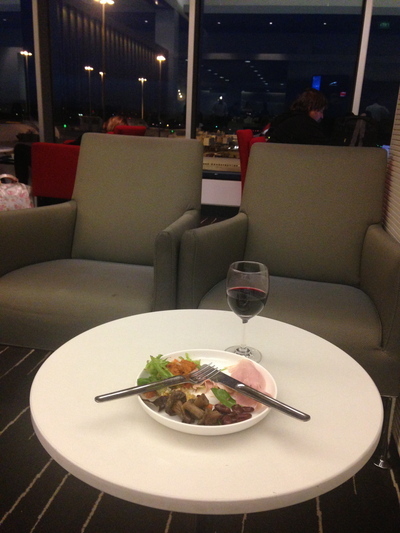 Add a glass of sparkling and you can really relax before you're called for your flight. 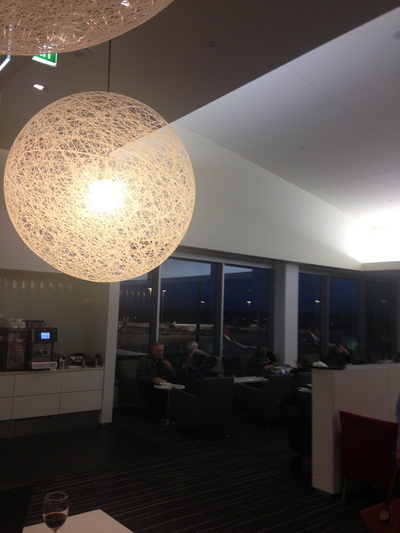 The amenities are pristine and the ever friendly staff are forever telling you to enjoy your flight. The shower nozzles are also amazing, far better than many home showers. Toiletries are also provided, otherwise it's okay to bring your own. 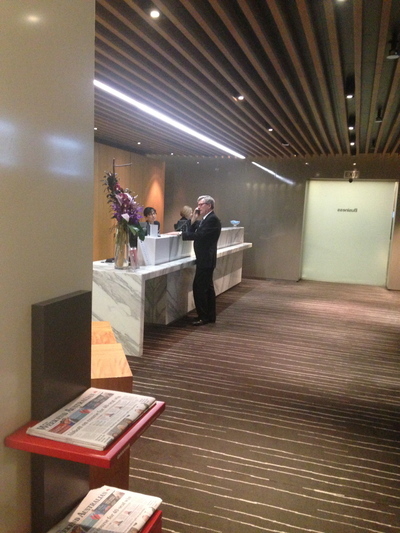 Ask at reception for towels. Quality wine and champagne selections. Self service. On a Sunday night, the lounge can get quite is busy. 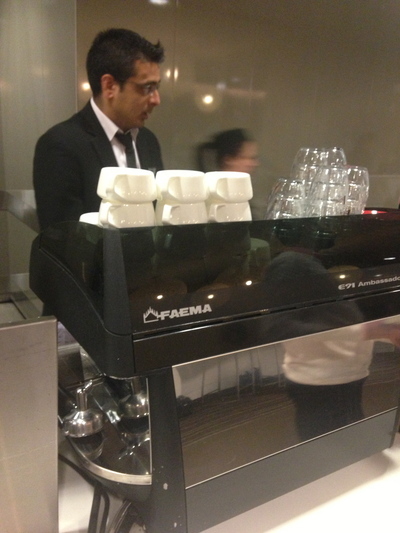 It is a pity that they start to close down the coffee machine at the bar.Otherwise, if you're the type to bypass a sweet cake, it is cool to munch on a few little sweets, that can be found at any one of the self serve coffee machines; these only allow you to brew your own espresso. There are Apple computer in the office, available for business or pleasure. You can also use the printer or make a few phone calls without having to use your mobile. It would be great to see them introduce some mobile-free zones for those who just want to sit back and relax. Otherwise the Qantas Club business class lounge at Melbourne Airport (Qantas Domestic Airport) is a great way to chill before an ongoing flight for work purposes. Best way to make friends in Sydney?